The Highcon vision of bridging the gap between design creativity and production capability, combined with Eco Concrete relentless pursuit of new technologies, lie behind the spectacular 2 meter Morpheus bench. This extraordinary design, coming to life with the help of Highcon’s 3D modeling technology, will be presented in Taipei by Eco for the “Creative Roughness – Contemporary Israeli Design”, part of a range of exhibitions being held during World Design Capital Taipei 2016 from July 9th until August 14th. The concrete bench was designed by Eco Concrete Ideas and produced using Highcon Rapid Layer Manufacturing technology to cut 4,000 layers of paper, resulting in the creation of a complex mold in a low-cost method. Faster than CNC and eco-friendly, it uses recycled board and there is no adhesive between the layers. This is a breakthrough in mold technology opening huge opportunities in architecture and beyond. Not only does Highcon technology dramatically reduce the costs of mold production, it also disrupts the creative cycle and dramatically cuts lead time. 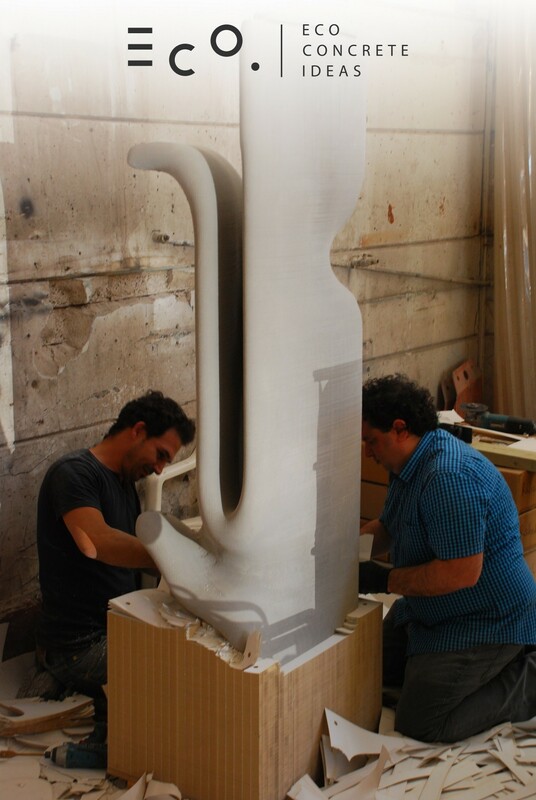 In the case of the bench, from first concept to completion was an unimaginable three weeks! Highcon customer, Skitza Print in Israel, produced the mold in a turnaround time of less than a week on their Highcon Euclid digital cutting and creasing machine, with actual production time of a few hours. The mold was made from standard recycled paperboard which was then filled with concrete. Extraction from the paper is simple and once finished, the mold was sent back to be recycled again. Although Eco experts say that it would have been impossible to produce this design by any current conventional method, they estimate that the production of anything similar would have been around ten times more expensive and would have taken months rather than days. The Morpheus bench was produced on the Highcon Euclid digital finishing machine with a dedicated 3D Modeling workflow solution that converts standard 3D models into separate layers that can be cut on Highcon machines. A paper mold can be produced quickly, with dramatic reduction in time and cost. Complex structures and textures can be created that are impossible in any conventional molding technology or in any known additive manufacturing technology. Fine details and smooth surfaces are achieved, when required, by very little post-processing. Eco Concrete Ideas is a leading brand for architectural and decorative concrete products. They offer a wide range of high quality products, textures, shapes, finishes, and colors. 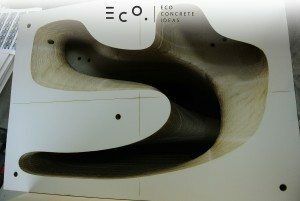 Eco brings innovation and creativity to the traditional world of concrete. Their innovative technologies put them at the cutting edge of the free form casting process and allow Eco to offer new solutions that always keeps the brand a few steps ahead.